In the past, we've only blogged trips on Little Rabbit's Planning. After a couple of days of migraine-inducing marathon planning for Summer 2018, I set myself a limit of 1 hour/day and decided to blog the process. 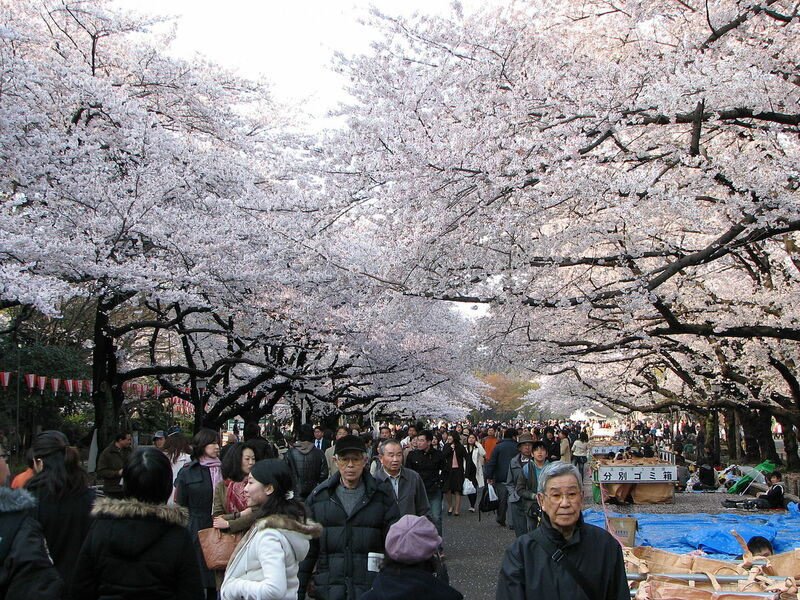 From Wikipedia: Ueno Park in spring, which is not when we'll be visiting, by a long shot. It occurred to me last night that I’d forgotten to check the location of cinemas in Tokyo. I’m sure there’s lots of them, but the closer they are to our accommodation, the better. I don’t think I’m going to be hitting the bars and nightclubs with my 16-year old daughter any time soon, but we’re quite likely to take in an anime movie. It doesn’t bother us if they’re in Japanese. In fact, I don’t even want to share with you the things my daughter has learned to say from watching Anime in Japanese. Also, while my brain was working on this Tokyo business in the background, I decided we would stay for 3 nights, nearly 4 full days. I reviewed the earlier part of the trip and made the definitive decision to stick to Tohoku Prefecture and Tokyo. You can really only see so much of Japan in one go. As for our 3 nights in Tokyo, there is one place that keeps working its way to the top of my choices in Booking.com: Centurion Ladies Hostel, overlooking Ueno Park. I would never normally choose gender-segregated accommodation but we are technically ladies (notwithstanding any specialist knowledge of Japanese one of us may have), and this hostel seems very suitable in every other respect. I looked at a few other places but as my hour ran out, I decided to lock it down and think about it later. Of course, 'later' turned out to be immediately. It’s only my second day of the 1 hour rule but already I overran my hour convincing myself that the Centurion Ladies Hostel would be perfect for us. I got happier and happier with it, until finally, I came across a site that said they only allow women over 17 years of age. Ooops! It turns out that when I filled in the search form, I’d entered Antonia as a second adult. After all, nobody gives you a discount on a 16 year old, and I don’t blame them. A 16 year old is a woman-sized person who eats for two women, while maintaining a disgusting ability to fits in a size 8 dress. Besides, in my head, travelling with Antonia is really like travelling with another woman. I mean, did I mention the THINGS that girl can say in Japanese? So now I had to overrun my 1 hour planning session even more by emailing the hostel to ask how they felt about 16 year olds who are travelling with their mothers. I was a bit frustrated about the whole thing, but I must say, they quickly sent me a very nice reply saying it would be absolutely okay for us to stay there. I’m very, very happy with this outcome. The accommodation may be basic, but it’s well reviewed, smart looking and super-inexpensive. It’s close to Ueno and several other metro stations, a short walk from two different cinemas, and it overlooks the boating lake in the park. As it turns out I’m pretty sure my totally grown-up woman travelling companion will still be in the market for swan boats upon a summer evening in Tokyo.